Hi, my name is Shuggie™! I hail from the Sugar Maple tree. What is a Leaf Critter, you ask? Well, do you ever watch the leaves in the trees during fall? Most of the leaves lose their green color turning yellow, orange, red, purplish, and even brown. And as autumn grows older, the leaves begin to fall to the ground. You know all this but did you ever notice that some leaves fly far from the trees? Some fly up to your roof, some fly over to your neighbor’s yard, and some fly far, far away. These leaves never fall to the ground the way the other leaves do … they keep flying and flying. And as they make their long flight, more than just their color changes … they are transformed and born anew to live in a unique land — the Valley of the Leaf Critters®. 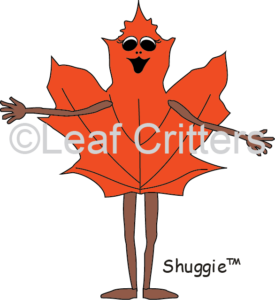 You can meet some of the Leaf Critters® right now. Click on Fun Items to see more.